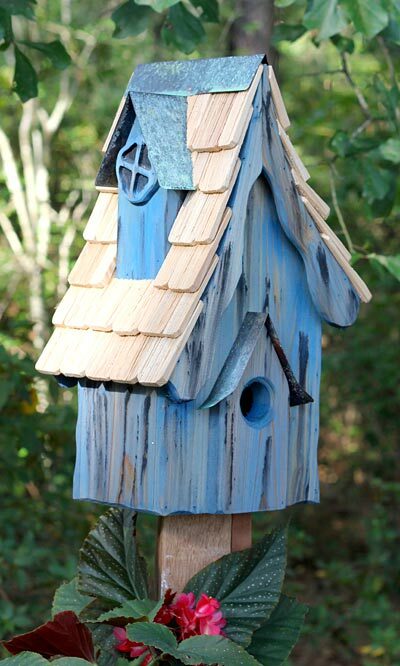 Add the charm of a country cabin to your bird garden with the Heartwood Blue Boyds' Bungalow Bird House. The shingled roof, cypress body, and metal accents on this shelter bring a whimsical look to your backyard, and are sure to delight both you and your feathered friends. The striking blue color of the home enhances your nearby blooms, and mottling throughout it creates an aged effect. The pitched roof sports slightly uneven sides, a scalloped fascia, and cypress shingles for a unique look, while verdigris copper flashing covers the top ridge. Additional, aged copper above the extended front panel and side dormer bring more texture and an artistic feel to this home, and a cleanout disc on the back completes the item. A 1.5" diameter entry hole sits on the extended front panel, allowing birds to easily roost in this bungalow, and the all cypress construction ensures a hardy shelter. Long slots beneath the roof overhang keep the home nicely ventilated, while a drainage gap on the base helps any captured water escape. Use the included, metal mounting plate to secure this home to a 4 x 4 post (not included), so both you and your birds can enjoy it for many seasons. Bring fun shape and curves to your backyard using the Blue Boyds' Bungalow Bird House. Made in the USA.